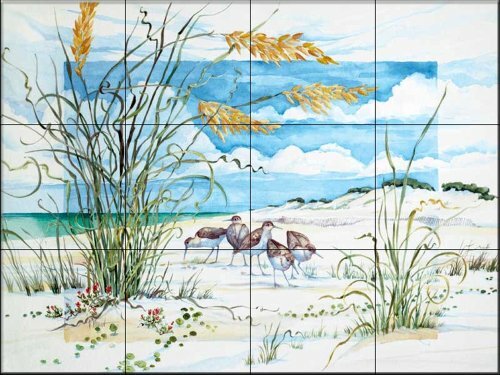 12 Tile Mural on 4 1/4" ceramic satin finish tiles. AMERICAN MADE !! This tile mural ships within 2 BUSINESS DAYS from receipt of order. Carefully wrapped and fully insured. Looking for a larger size of this mural or prefer to use your own image for a completely custom tile mural? No problem - contact us for a reasonable quote and fast service. If you have any questions about this product by The Tile Mural Store, contact us by completing and submitting the form below. If you are looking for a specif part number, please include it with your message. Bianco Venatino Marble Honed 5 X 12 Baseboard Trim Molding - STANDARD QUALITY - Lot of 20 Pcs. Tile Floor Medallion Marble Mosaic North Star Design 34"